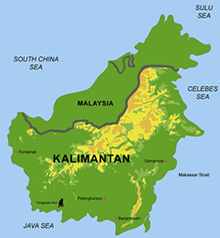 In 1997, 2002 and 2006 El Niño prolonged the dry season considerably causing strong fires, haze and smoke in Central Kalimantan. The peatland fires during the dry season have greatly increased, caused mainly by the Ex-Mega-Rice Project (MRP). To understand better the situation of that area more than 90 peat drillings have been done in 2006 parallel to the Kalimantan highway along the transect Tangkiling and Kasongan. Results of these peat measurements showed a peat depth up to 8.10 m. The estimation of stored peat volume and carbon for the northern Sebangau Catchment and Palangka Raya between Katingan and Rungan rivers up to the border of the heath forest has a peat volume of 7.1 Gm³ (res. 5.93 Gm³). The content of carbon in 1 cubic meter of peat has been measured to be 154.3kg. We found a stored carbon value of 0.92 to 1.1 Gtons for this area. The pH-values of water were very acidic and three soil samples showed a very low nutritional value. It will be necessary to rehabilitate this fragile peatland ecosystem. 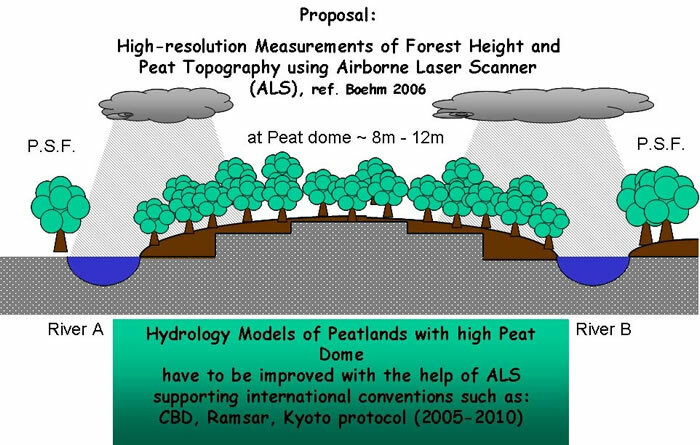 With a high-resolution Airborne Laser Scanner (ALS) the topography of peatlands will be measured in Feb. 2007 by an helicopter. Also the biomass of Peat Swamp Forest (PSF) will be analysed by this modern technology with an elevation resolution of +/-15cm. Additionally illegal channels in PSF will be monitored and the hydrology model of peatland improved.